They may not have sidewalks for their bikes or any neighbors under 50 in a five mile radius, but kids in the country know how to have fun. 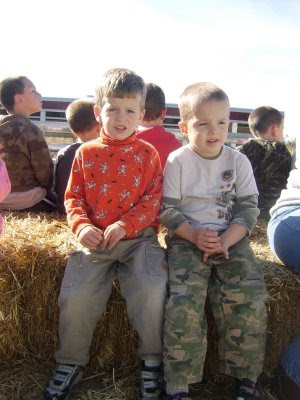 This weekend our kids and their country cousins hosted a fall party at the farm. Thank goodness we invited our teacher mother and teacher mother-in-law for crowd control, because we did not know how to manage 19 kids. We did some things right like planning lots of activities, but the very challenge of keeping the attention of that many kids while you give instructions and organize them--that's why teachers make the big bucks (oh, wait...). You MUST click on this photo to see the full cuteness of these pumpkins. They decorated pumpkins using "Mr. Potato Head" branded kits with plastic pieces. If such things existed when we were kids, they would have come equipped with sharp points, probably metal, for stabbing into the pumpkin. I'm not sure how the people at Hasbro think that their rounded plastic tipped parts are supposed to pierce a raw vegetable, but having done this before, we were prepared with screwdrivers with which to stab Mr. Pumpkin Head repeatedly until all 13 parts were added. While I handled all the invitations, cleaned the house, made the cupcakes, weeded the flower bed, and procured two dozen Mr. Potato Head kits, my husband had one main job for the party--the straw maze. 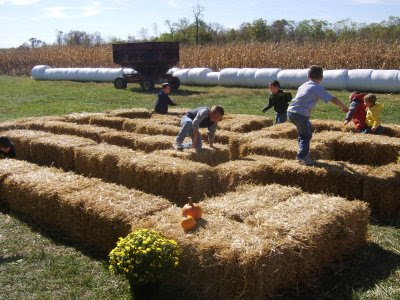 And while he did grumble about getting 50 bales out of the barn, I think he had fun making the maze. All the kids LOVED it. 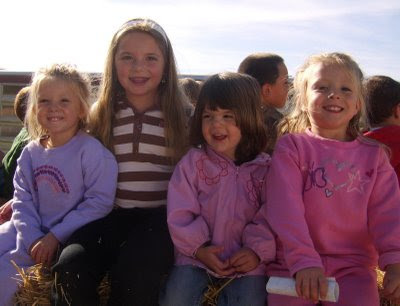 What party on the farm is complete without a hay ride. Note: all regular readers of this blog should know that we don't really use hay. This was Morgan and Justin's first opportunity to invite their own friends to a party. Morgan invited "big girl" friends of the family and Justin invited friends from pre-school. 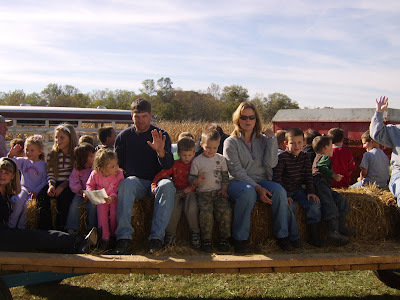 In two hours we played in the straw maze, went on a treasure hunt around the farm, made sand art in a jar, ate a snack, decorated pumpkins and went on a hay ride. Whew. Try doing that on your cul de sac.